This post, one of a series I'll be doing, will show all the special issues for stamp exhibitions that NZ Post attended during the 1980s. It is most likely that we will not feature most of these issues on their own pages so they have been collected here. The first special issues for stamp exhibitions were overprints of existing miniature sheets such as the miniature sheet directly below but as you move down this page you will discover the beginning of a change from overprinted miniature sheets to sheets specially designed for particular exhibitions. 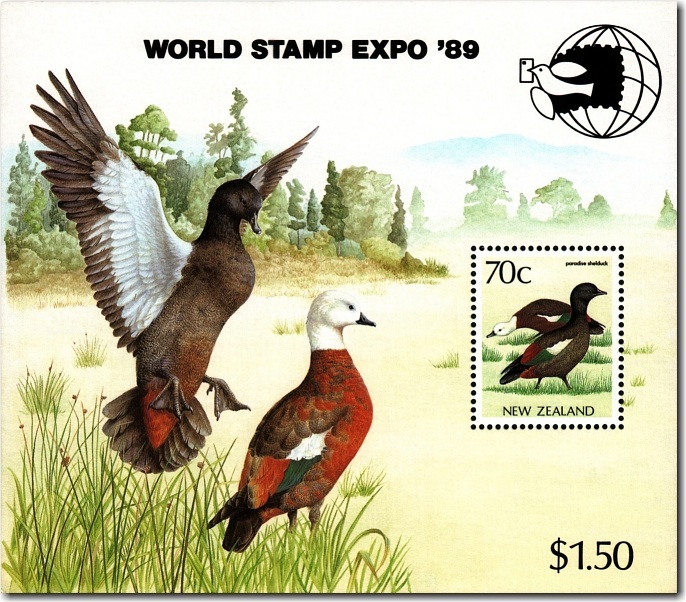 Zeapex '80 International Stamp Exhibition. This miniature sheet was issued with and without the central overprint. It features three stamps from the 1980 Anniversaries. 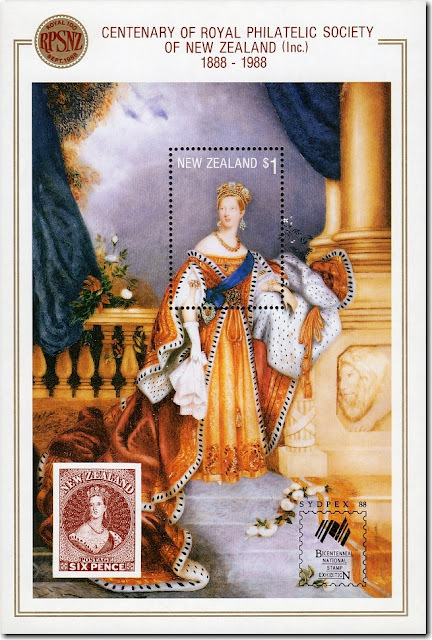 The issue makes the 125th anniversary of postage stamps in New Zealand and the stamps show copies of those original stamps 1855 Full-Faced Queens. 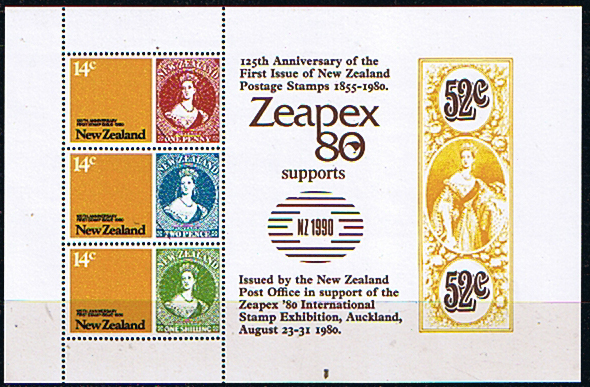 Zeapex '80, the stamp exhibition held in Auckland, was part of these anniversary celebrations. 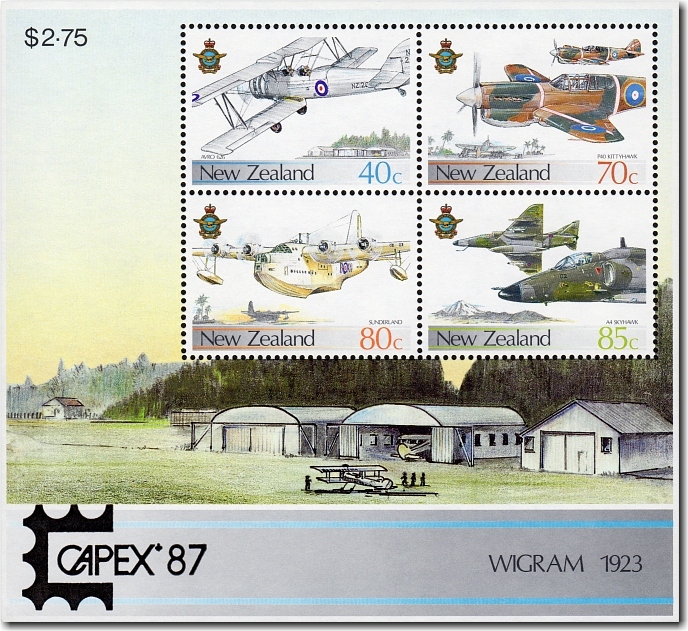 1980 Anniversaries miniature sheet with the Zeapex '80 overprint. 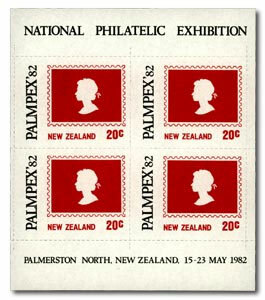 This postage label was issued to commemorate the National Stamp Exhibition held at the Centennial Convention Centre in Palmerston North on 15-23 May 1982. Of the 18,000 sheets produced 4,000 were reserved for sale to supporting exhibition members as mint sheets; 3,000 were used on first-day covers; 2,000 were used as single labels on four mailings to supporting members and the balance used in various ways at the Exhibition. The design, depicting Queen Elizabeth II side face, reflected the centenary of the Queen Victoria 'Second Sideface' issue of 1882. Sheets comprised four 20c labels depicted a profile of Queen Elizabeth II in red and black on white background. This design had previously been used in the 1978 Special Purpose Coil Stamps. 1985 National Youth Philatelic Exhibition. This miniature sheet was first issued for the 1984 Antarctic Research issue. 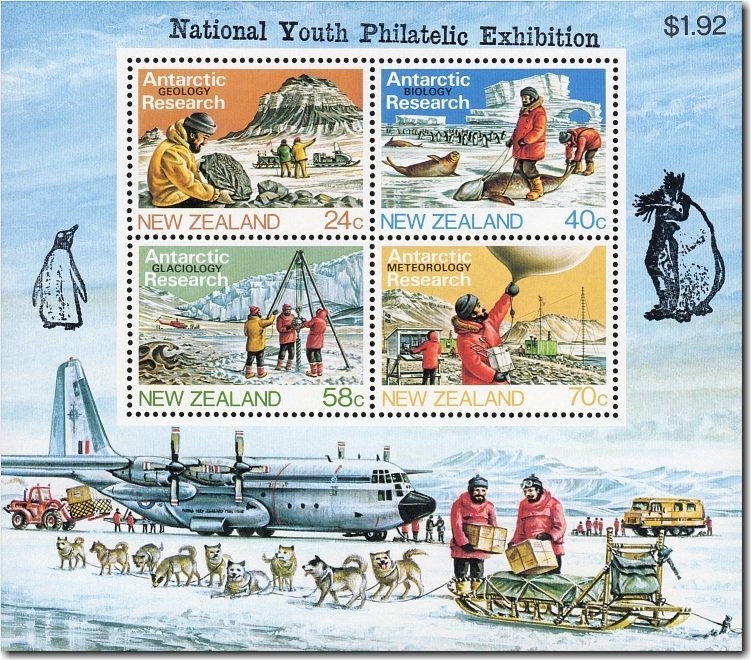 The stamps show New Zealanders working in four different fields of science in the Ross Dependency of Antarctica. 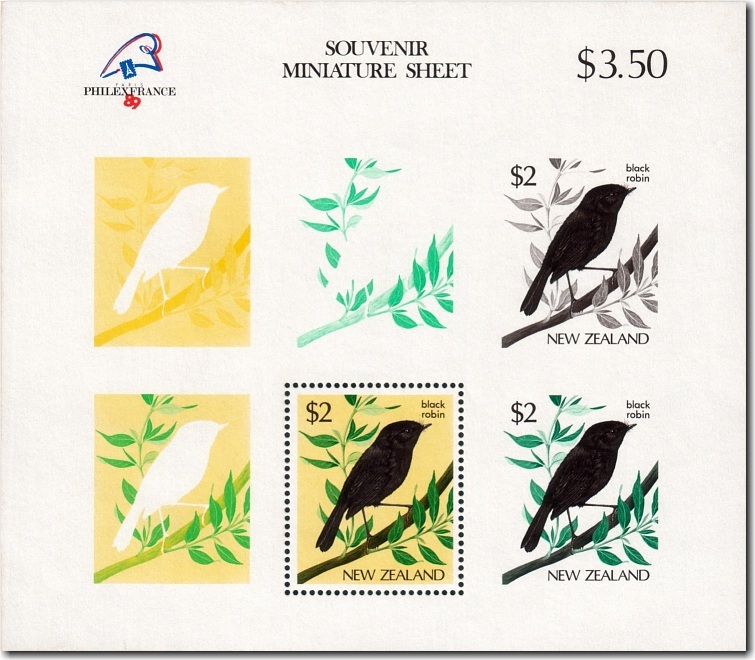 A quantity of the miniature sheets were overprinted with 'National Youth Philatelic Exhibition' across the top and a penguin on either side to support the Stampex '85 National Youth Philatelic Exhibition which was held in Christchurch from the 29th of August to the 1st of September 1985. The quality of the overprint is quite variable. 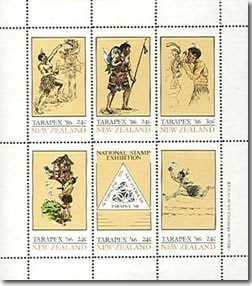 This sheet of six postage labels was produced to help fund the Tarapex '86 National Stamp Exhibition held in New Plymouth between 17-27 October 1986. The labels were used on pre-exhibition mailings to supporting members and sheets were sold mint and on covers for fundraising. The images on the labels were based on illustrations completed by A H Messenger. The $1.50 miniature sheet consisted of six labels - five at 24 cents and one at 30 cents. We have had trouble finding good images of these stamps. The 1986 Scenic Coasts and 1986 Health miniature sheets were also issued with the Stockholmia '86 overprint to celebrate New Zealand Post's attendance at the Stockholmia '86 World Philatelic Exhibition in Stockholm, Sweden. 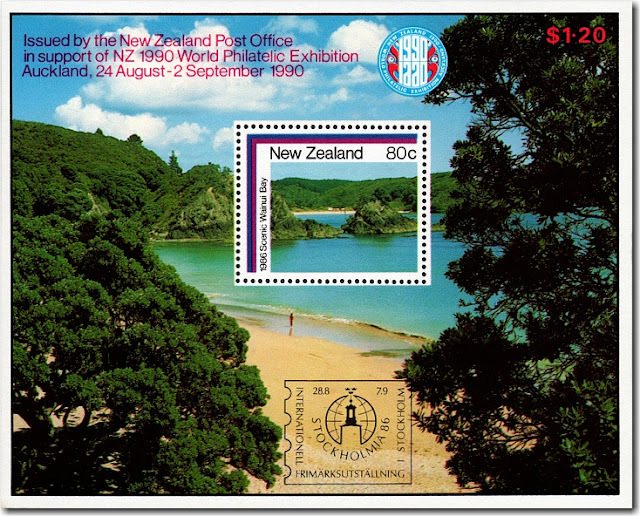 80c Wainui Bay, Northland is the stamp shown on this miniature sheet. The sheet was actually designed and issued to raise funds for the 1990 World Philatelic Exhibition but some were overprinted for Stockholmia '86. I like the way that the tiny image of the stamp is apart of a much larger picture. 1986 Health issue overprinted for Stockholmia '86. 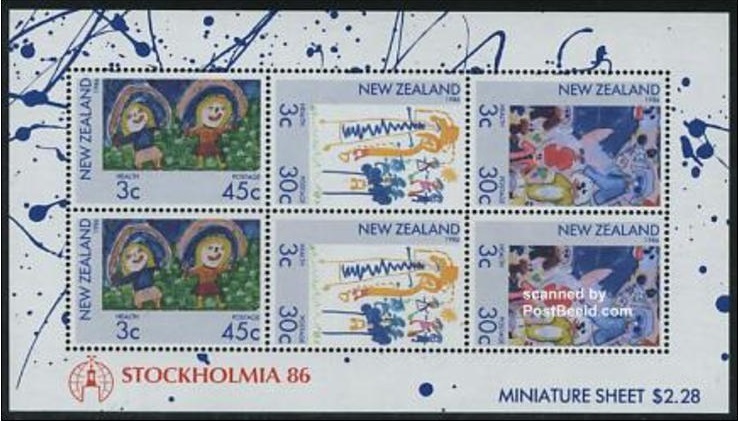 New Zealand health stamps carry two values, the first larger one being for postage and the second a surcharge for funding children's health camps. The stamp designs are children paintings of playing sports. 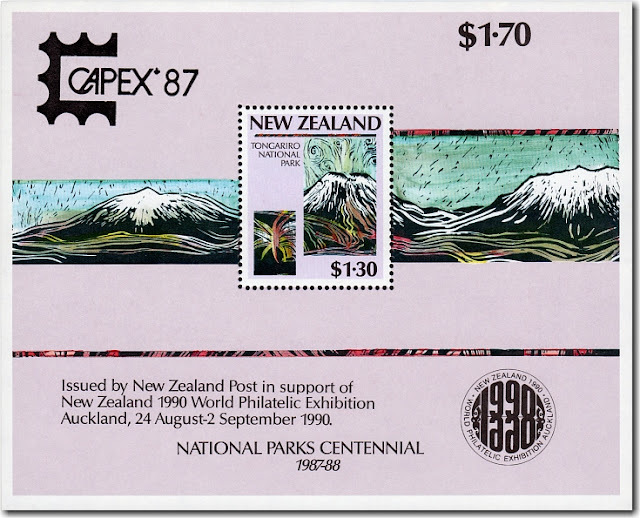 .The 1987 Royal New Zealand Airforce and the 1987 National Parks Scenic Issue miniature sheets were issued with Capex'87 overprints to commemorate New Zealand Post's attendance at Capex'87 - the World Philatelic Exhibition held in Toronto, Canada from June 13th to the 21st, 1987. The miniature sheet shows Wigram Airfield, near Christchurch, in 1923. This became one of the Air Force Bases until it was closed. The stamps are: - 40c AVRO 626 / Wigram Air Base; 70c P40 Kittyhawks / Pacific Islands; 80c Sunderland Flying Boat / Pacific Island Lagoon; 85c A4 Skyhawks / Mount Ruapehu. 1987 National Parks Scenic Issue miniature sheet shows the $1.30 Tongariro National Park with Mount Ngauruhoe in eruption, a remarkably symmetrical cone that has grown on the one shoulder of the older Mount Tongariro. 1988 Royal 100 National Philatelic Exhibition. 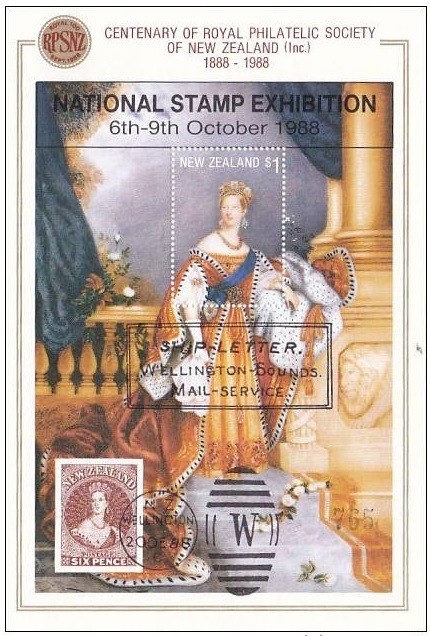 The 1988 Centenary Philatelic Society miniature sheet from this issue was overprinted by the New Zealand Government Printer with a Royal 100 logo in support of the Royal 100 National Philatelic Exhibition, held in Wellington 6 - 9 October 1988. This exhibition was organised by the society as apart of their centenary celebrations. The 1988 Centenary Philatelic Society of New Zealand Miniature sheet was overprinted for the Australian Bicentennial Philatelic Exhibition which was held in Sydney. This miniature sheet commemorates the 1989 World Stamp Expo held in Washington DC, America from the 17th of November to the 3rd of December 1989. 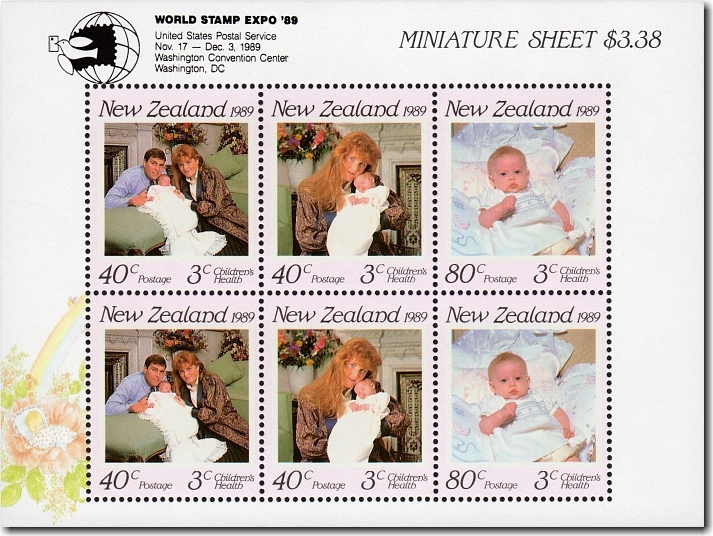 The 1989 Health miniature sheet was also overprinted to commemorate this show and was only available for sale from a stand at the show.